We’d love your help. Let us know what’s wrong with this preview of Deception of the Damned by P.C. Darkcliff. Sleeping Beauty meets Faust in this spellbinding ride through time and magic realms. An absent-minded dreamer, Hrot feels miserable in his primitive times—so he sells his soul in exchange for a decade in Renaissance Prague. There he dabs in occult studies in a desperate attempt to sneak out of the deal. 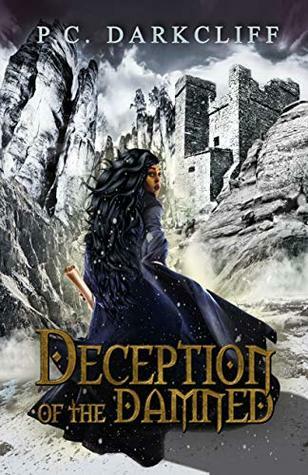 Four centuries later, young reporter Jasmin Bierce leaves Alaska for E Sleeping Beauty meets Faust in this spellbinding ride through time and magic realms. Four centuries later, young reporter Jasmin Bierce leaves Alaska for Europe to avenge the death of her husband. Facing more enemies than she expected, her quest for revenge turns into a flight for her life. As she stumbles into the ruins of a medieval castle, she meets an immortal specter who calls himself…Hrot. Although he saves her skin, Hrot unwillingly drags her soul into a pact with the fiend who cursed him. The fiend makes her husband’s killers look like a flock of doves—but Jasmin’s heart is awakening to Hrot’s devotion, and she travels in time and skirts infernal dominions to save him. If she ever wants to break their curse, however, she must succeed where Hrot failed: she has to outwit the Emissary of the Otherworld. To ask other readers questions about Deception of the Damned, please sign up. Great read, i had a bit of trouble in the transition between part 1 and 2 in the changeover between Hrot and Jasmine, but soon got into the transition. For a a debut novel ill definatly be checking out more of this authors work. For a first book, this novel is really well crafted. I enjoyed the pacing of the novel and was immediately drawn in by the prologue; the second half was brilliant. The characters were well developed. In fact, Hrot was a bit of a surprise as at first, he didn't have the makings of a hero. Throughout a majority of the novel he was really quite pathetic, despite his intellectual curiosity. His clumsiness was astounding, and it was a wonder he didn't kill himself the first few chapters of the book. For a first book, this novel is really well crafted. I enjoyed the pacing of the novel and was immediately drawn in by the prologue; the second half was brilliant. The characters were well developed. In fact, Hrot was a bit of a surprise as at first, he didn't have the makings of a hero. Throughout a majority of the novel he was really quite pathetic, despite his intellectual curiosity. His clumsiness was astounding, and it was a wonder he didn't kill himself the first few chapters of the book. Still he was fundamentally likeable, and I rooted for him the whole way (except for a certain section of the novel which I won't spoil for you). Did he really make a deal with the devil with true agency, or was he manipulated into it? Did he really have the intellectual capacity to be an alchemist? Who knows because he was such a klutz! Jasmine, the protagonist of the second half of the novel was also a delight. I loved her moxie and inner-strength. The side characters were also wonderful and I wanted to get to know them a bit more. The villain, good Lord, I wanted somebody to shred that jerk to pieces and send him into an eternal pit of despair. The second half of the novel, all in all, was quite strong and more of a page turner for me because the action was punctuated with beautiful descriptions and slower pacing for the characters to struggle with internal conflicts. My only criticism was with some loose ends. There is an assassination attempt against one of the side characters, but it was never explained who wanted to kill this female character. I also wanted more of a window into the alchemist's world. That would have made the first half more interesting to me. Still, these considerations are minor. A very captivating story!! The way situations has been described by the author takes me to the character’s world! Loved the twists and turns!! Some friends are worth dying to save, others are dying to kill you. Can a resourceful ping woman survive when Evil befriends her? *FULL DISCLOSURE* I did NOT finish this book. I made it to chapter 6 before I started to fall asleep. It's no where near bed time, so I'm done with this. Good luck to you. This is a very rich story that journeys not only across Europe, but across time as well. It is full of twists and turns, taking you to places you never expected. I was up at all hours of the night reading to find out what happens next. It is so masterfully written that I felt as if I was taking the journey along with Hrot. There is so much depth to this story that there could easily be a sequel. Fans of Christopher Marlowe will very much enjoy this author. I have been writing fiction ever since I learned my letters, and my first attempt was a short story about a talking dog. After a brief flirtation with sci-fi and adventure, I discovered the world of fantasy and supernatural fiction—and there was no turning back. Apart from several short stories, I’ve written three novels and a trilogy. My debut, Deception of the Damned, is available on Amazon. The I have been writing fiction ever since I learned my letters, and my first attempt was a short story about a talking dog. After a brief flirtation with sci-fi and adventure, I discovered the world of fantasy and supernatural fiction—and there was no turning back. Apart from several short stories, I’ve written three novels and a trilogy. My debut, Deception of the Damned, is available on Amazon. The second novel, The Priest of Orpagus, is coming out this summer. In 2020, I’m going to release God of Madness, along with the first installment of Deathless Chronicle. I have lived in six countries and on three different continents. Although ruinous to my bank account, the seminomadic lifestyle has been hugely inspirational, and many of my adventures have spilled into my stories. My wife and I have recently settled in southwestern Spain, where I go swimming and cycling whenever I’m not too busy writing. You can reach me at pcdarkcliff@gmail.com. My inbox is always open to you!